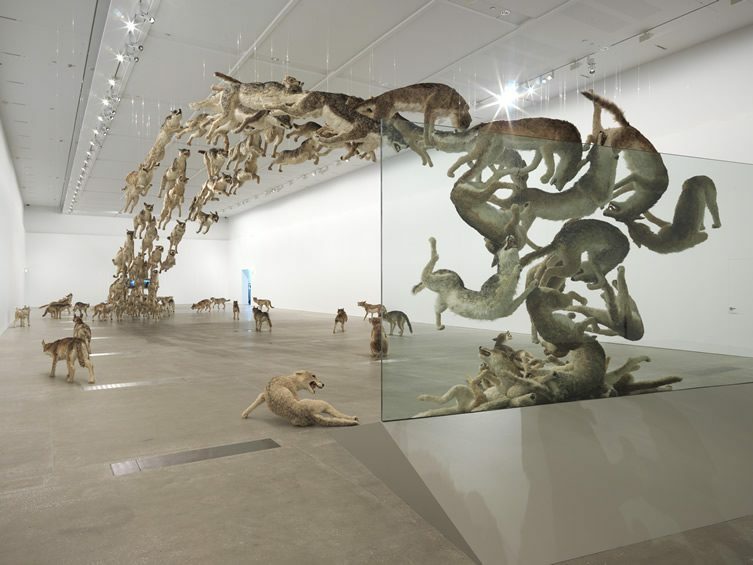 Sculptor Cai Guo-Qiang‘s spectacular large-scale works are currently filling the Gallery of Modern Art (GOMA) in Brisbane as the venue hosts an impressive exhibition of the Chinese artist. 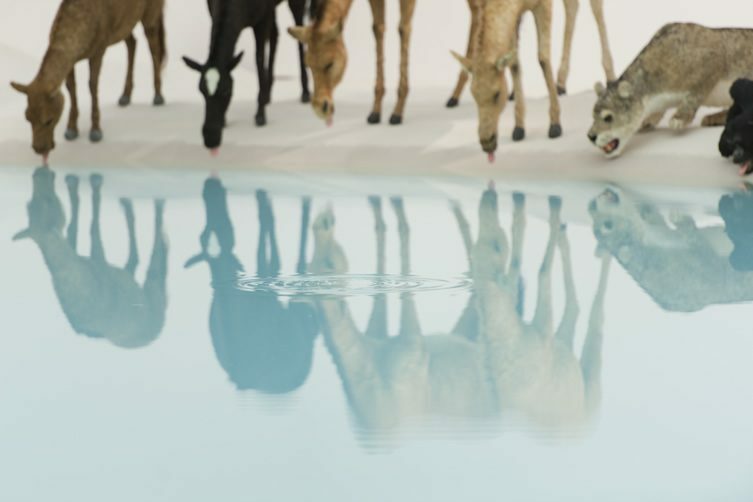 As part of Falling Back to Earth, the gallery’s largest display space has been completely transformed into a literal and symbolic oasis at which 99 seemingly antagonistic animals put aside their natural antipathy to drink together at a lake. But is the image simply a mirage? Cai’s work is not without moments of levity if you have the right (or wrong) sense of humour. In his most spectacular installation at the GOMA, we see the sculptural equivalent of the You’ve Been Framed clip of a man walking into a closed patio door. 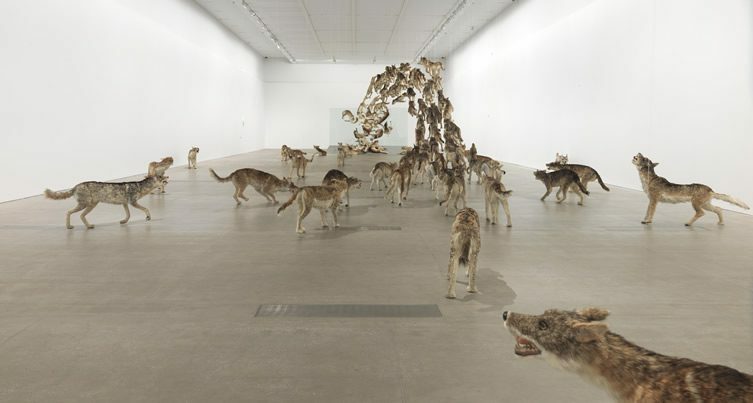 In this more graceful version called Head On, 99 life-sized wolves leap majestically through the air and smack face first into a glass wall, before seemingly picking themselves up, dusting themselves down and heading back to the start for another go like they’re queueing for a waterslide. 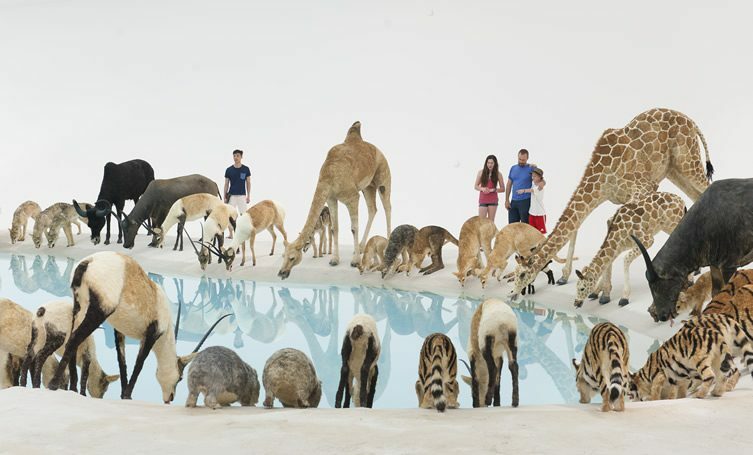 Commissioned by the Deutsche Guggenheim in 2006, the work is a serious commentary on the folly of the collective blindly following misdirected ideologies, with the glass wall representing the city’s former East-West barrier. 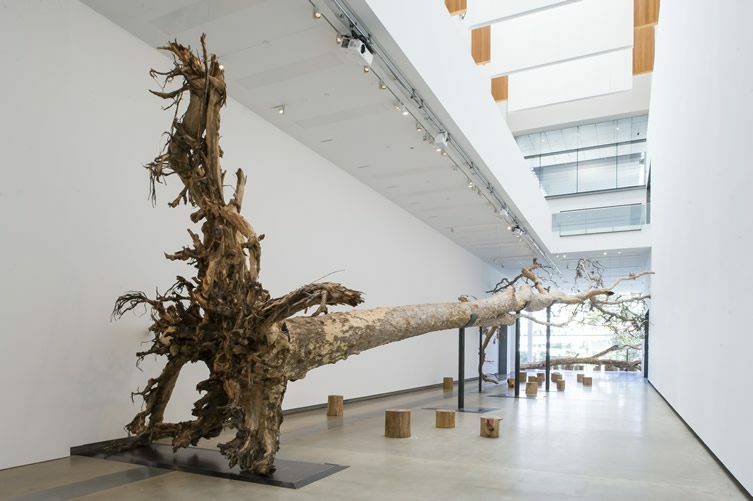 Falling Back to Earth runs until 11 May 2014. 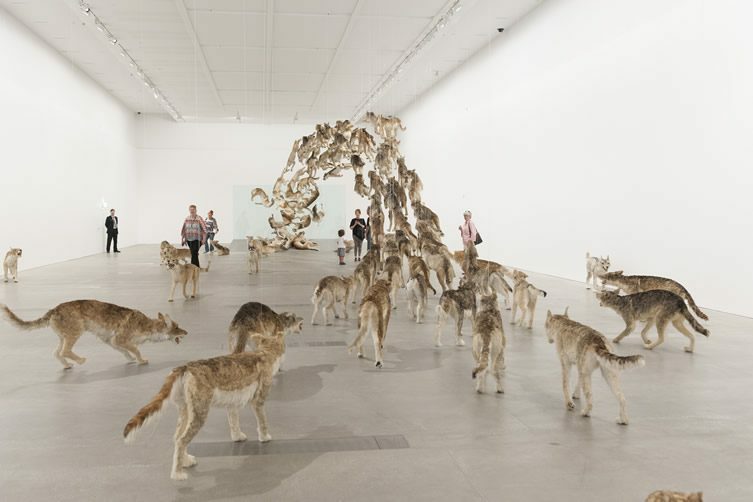 99 life-sized replicas of wolves and glass wall. 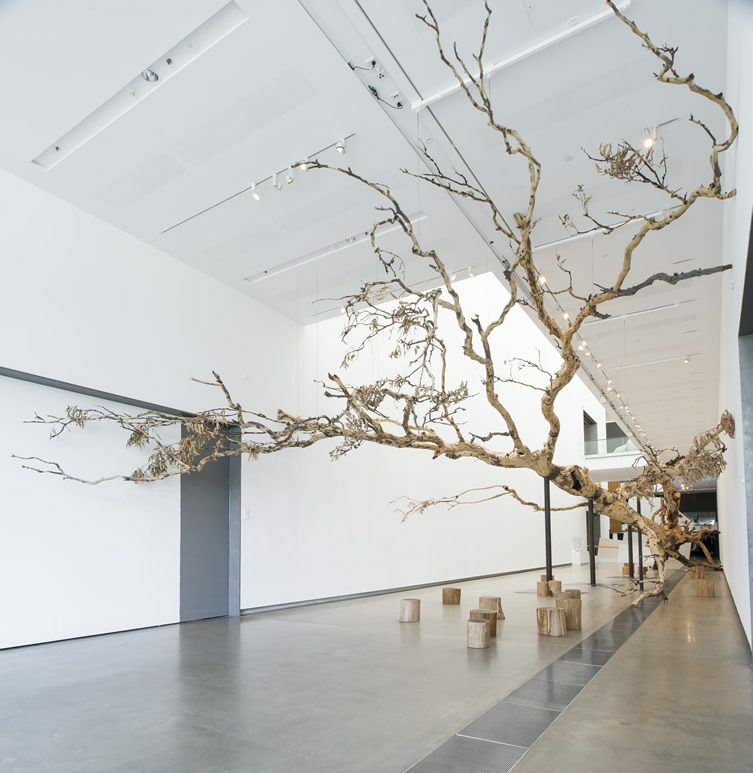 Commissioned for the exhibition ‘Falling Back to Earth’, 2013.